You’re in Good Company: More than 150 new members (and counting) in 2018! 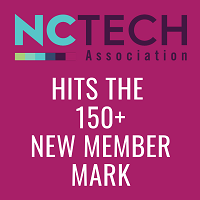 View a list of the companies, organization and institutions who joined NC TECH this year. All members have company profile pages online – we encourage you to Meet Our Members to get to know your fellow members and make connections by utilizing the search functions online directory. If you need help updating your company profile page, please contact Lee Yates. And if you’re not a member, we hope you will contact Carol Zimmerman to learn more about joining our dynamic network. OneMagnify · OneTeam Leadership · OnPar Technologies · OnWire Consulting Group · Optimized Communications · Overground · Parker Poe Adams & Bernstein · Piedmont Service Group · Pinnacle Financial Partners · Powersports Data Solutions · Prism4USA · Project Shift · RapidOps, Inc. · RBC Bank · Reveal Global Consulting · Rocket Hangar · RPX Corporation · Schober Test Systems · Scientific Environmental Design (SED) · SCOR Consultants · SeeSnapGet · SHAWNEE Technologies · Snowflake Computing · SolarWinds MSP · Spectraforce Technologies · Storr Office Environments · Supreme Court of North Carolina · Swain Center · Syndicus · Talent Dimensions · Tanjo · TeleSource Communications · Temprano Techvestors · Teradata · The Law Office of Chris Clark · The Nautical Group · The Power of One · The Q Works Group · The Trade Show Manager · ThousandEyes · Thrall Consulting · Town of Morrisville · Trend Micro · Trilliant Networks · Tri-Merit R&D Tax Services · TRU Colors Brewing · Unanet · UNC Kenan-Flagler · Unique Comp · Uni-SPIRE · University of NC System Office · USM Business Systems · VeriQuest · Viyb Health · Walk West · WeWork · WGU North Carolina · Whitehall Advisory Group · WhiteHatAl · Wilmington Health · Worldwide Environmental Services (WES) · Worldwide Supply, LLC · WorthWize Consulting · Zadara Storage · Zendesk · and more to come……..